Midawarr | Harvest explores the plants of north-east Arnhem Land through artworks by Yolŋu elder Mulkuṉ Wirrpanda and landscape painter John Wolseley. MULKUN WIRRPANDA: My relative Birrkitji number one taught me. He was a law man and a keeper of knowledge, and he taught me a painting called, yalata (the home of the brolgas). In a place called Barrŋgul Dhuruputjpi. He taught me däŋgultji (brolga) painting. I was working on that painting ... I also painted a Yirritja painting, my mother's painting called birrkuda (wild honey), while painting it, it made me understand I could see it through my own eyes, the honey painting, I was painting, I said to myself 'I'm going to stop painting this ... and I'm going to look for a different painting about food' that's what I said a bush food that I gathered and ate. JOHN WOLSELEY: Mulkun Wirrpanda, the great Yolŋu artist, has painted thirty to forty paintings of the edible plants of her clan area. Each one of these paintings is a great work of art and each one of them is different and gets the particular quality of the particular food plant. Now she did this, because she said her people are dying because of eating the wrong food. MULKUN WIRRPANDA: Wash it gently, not hard. Keep cleaning it, keep cleaning it. This one, but the root is salty, like this one, yes that one too. JOHN WOLSELEY: What's that one there? JOHN WOLSELEY: Ah wonderful, my goodness me. Oh look! JOHN WOLSELEY: Look at that, yukuwa. Yukuwa. MULKUN WIRRPANDA: This is the new shoots of the yam growing called ganguri. Old people ate this food and they replanted the yam by pushing the soil back and then I learnt to replant the yam by pushing the soil back, at Yilpara I started doing this. JOHN WOLSELEY: She decided to paint all these ... plants which don't usually figure in the traditional paintings about the Yolŋu beliefs and stories. It's almost as if she was doing an equivalent of a flora of the European idea of the flora of her country. MULKUN WIRRPANDA: We established Yilpara homeland. We lived with and gathered manmunga (ganguri yam). We stayed full with this yam and nindan (another yam). We established Yilpara with only small amounts of white man's food. This is the food our old people used to eat. We are painting a food called bulwutja. This is a corm we can eat called bulwutja. This is the corm's leaves and this is its water. Its pattern. The food grows in the water. JOHN WOLSELEY: So this one is ... flowing in the water. MULKUN WIRRPANDA: This is the pattern of the water. I don't know what kind of water you're drawing brother. And this bulwutja is from Yalmakany and I painted this bulwutja. Bush food, but forgotten now. Our old people lived and survived on this food and they never got sick, our old people, and then the foreign food came, and brought sickness for the Yolŋu people. The Yolŋu people got sick with the foreign food. From white people. With our food our old people never got sick. They were strong. The food is bulwutja, it's ours grandchild for Djapu, our family, our spirit people. Here at Rarrirarri, where we are, where that food is located in our area at Garaŋarri. JOHN WOLSELEY: It's one of the most powerful landscapes in the world within its culture and it is the landscape which has been cherished and lived in for thousands of years by the Yolŋu people who have got powerful stories about how the landscape was made. MULKUN WIRRPANDA: Over this is the big swampy plain, it goes from here to a Yirritja place Until ... further on, further on to the place called Bomatjpi that's where the swampy plain ends. This is where we ate guwita (witchetty grubs) a long time ago a mob of us. Including Woŋgu ate them too. Grandfather, old man Woŋgu Mutjaŋga's father. From räkay (water chestnuts) the grubs. The name Läŋgurrk (witchetty grub) what this man is named after ... I gave the name Läŋgurrk, to this man. The National Museum of Australia's Midawarr exhibition featured more than 80 works and immersive multimedia experiences created by the Yolŋu community to give visitors insights into the special relationship between these two artists, and ancient Yolŋu knowledge of sustainable living. Midawarr means ‘harvest’ in the Yolŋu matha (language). It is the season when rich plant life on Yolŋu country is ready to be collected and prepared. 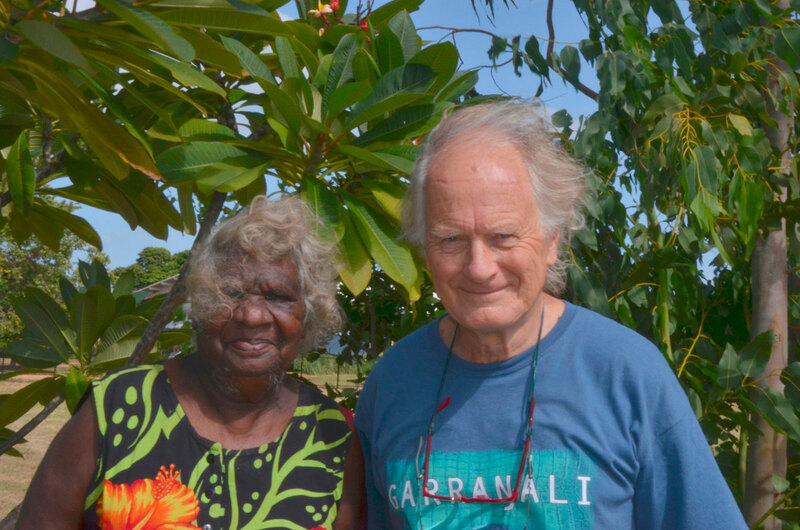 Mulkun Wirrpanda and John Wolseley have met every midawarr and other times in the past five years to research and document the many useful and delicious plants which, for centuries, have sustained communities in this unique part of the continent. Mulkun and John's collaboration has resulted in a body of artworks including bark paintings, larrakitj (decorated memorial poles), printmaking and a monumental watercolour and mixed media painting. Mulkun Wirrpanda is a senior elder of the Dhudi-Djapu clan of the Dhuwa moiety. Her early life was spent with her family in the normal pursuits of living from the land and marking life’s process through ceremonial activity. She was an early pioneer of the Homeland Movement and has until recently spent all of her time in the remote homelands of Yilpara, Dhuruputjpi and Gängan.She has been making art since the 1980s and is a senior ceremonial authority. Her passion for the land and its law is being continued by her two daughters, Yalmakany and Gurrundul, who are both senior rangers, and her son, Borrak, who is a lawman. John Wolseley was born in England in 1938 and arrived in Australia in 1976. His work in watercolour, drawing, printmaking and installation over the last 40 years has been a meditation on how the earth is a dynamic system of which we are all a part. He is represented in all state and national galleries and has received numerous grants, awards and prizes. Midwarr | Harvest is supported by the National Collecting Institutions Touring and Outreach Program, an Australian Government program aiming to improve access to the national collections for all Australians.